VATICAN CITY (Reuters) - The first visit by a pope to the Arabian peninsula will take place in February when Francis travels to Abu Dhabi in the United Arab Emirates, the Vatican said on Thursday. The Feb. 3-5 trip, Francis' latest to a predominantly Muslim nation, will be centered around the theme of inter-religious peace. The Vatican said the pope had accepted an invitation from Sheikh Mohammed bin Zayed al-Nahyan, Crown Prince of Abu Dhabi, and the tiny Catholic community there. He will attend an inter-faith meeting. In a statement, Bishop Paul Hinder, head of the Roman Catholic Arabian Vicariate of Southern Arabia, thanked the UAE government for having given permission for the pope "to celebrate a Mass at a public venue in Abu Dhabi". The freedom to practice Christianity — or any religion other than Islam — is not always a given in the Gulf and varies from country to country. In the UAE and Kuwait, Christians may worship in churches and other places with special licences. Saudi Arabia, home to Islam’s holiest sites, bans the practice of other religions. Hinder, whose jurisdiction includes the United Arab Emirates, Oman and Yemen, said the Mass would be held on Feb. 5. Francis has visited Turkey, Jordan, Egypt, Bangladesh, Azerbaijan and the Palestinian territories and used those trips to call for inter-religious dialogue and to condemn the notion of violence in the name of God. "The theme of the visit is 'Make Me a Channel of Your Peace' – and that's the pope’s intention in going to the United Arab Emirates. 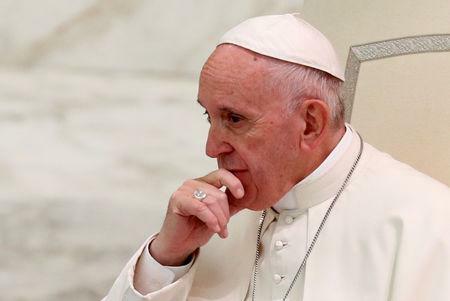 How all people of goodwill can work for peace will be a major topic on this trip," Vatican spokesman Greg Burke said. The theme is taken from the opening words of the Prayer of Peace of Francis of Assisi, the saint whose name the pope took when he was elected in 2013. "This visit, like the one to Egypt, (2017) shows the fundamental importance the Holy Father gives to inter-religious dialogue. Pope Francis visiting the Arab world is a perfect example of the culture of encounter," Burke said. Crown Prince Mohammed said in a tweet that the pope "is a symbol of peace, tolerance and the promotion of brotherhood. We look forward to a historic visit, through which we will seek dialogue on the peaceful coexistence among peoples."